I’m not sure there is anything that can prepare you for riding along at 45kph in the middle of a peloton, hearing the whirring of carbon wheels and shouting of other riders who just happen to be millimetres from your back wheel. 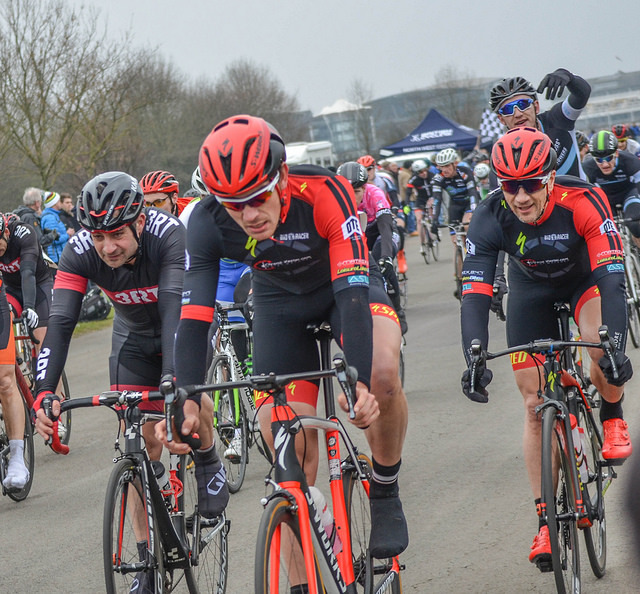 Having made the jump from racing triathlon to cycling for the 2016 season, the Eddie Soens race happened to be my first road race of the season, my first race for Team Chronomaster and also my first ever road race, full stop. It was an early start to make the journey over to Aintree for the race and shortly into the lift that Si (Deplitch) had kindly offered me he remembered that actually his bike did indeed require 2 wheels, and not just the one he currently had in the car, and that we would be needing to make a short detour to his house. Eddie Soens is a handicap race whereby the higher category riders and juniors go off ninety seconds before the lower category riders and then the elites are set off in a small group ninety seconds after that. Chris Boardman was around to drop the start flag and away we went… My first road race was under way. 1 lap into the race and I found myself on the front of the first group. Even with my limited experience I knew that this was probably not a very sensible place to be with the Elite riders on the hunt only minutes behind so slowed up and slotted in somewhere in the middle of the group. For the first 10 laps the pace was fairly easy with the impending catch bound to take place at some point. The second group caught on after around 10 laps and then the elite group caught on around 2 or 3 laps after that. Soon after this (probably around lap 20-25) a group of elite riders (plus one third cat, who eventually went on to win the race!) broke away from the main peloton and this move stuck. To be honest I am not entirely sure of when specific events took place during the race – I was in such a deep level of concentration just wanting to see the road at the other side of the next bend that I didn’t have chance to think about a great deal. There was a crash involving around 4 or 5 riders in the middle of the peloton before halfway. The sound of the crash was all I heard – that distinct sound of carbon scraping on tarmac. The crash made me realise just how easy your race and potentially season could be turned around. In response I consumed a gel and got back to concentrating on that wheel in front. Si tried to talk to me at one point however I have absolutely no idea what it was he was trying to shout over the noise of screeching brakes – my concentration on that wheel in front remained. Given there was a group of riders up the road from the main peloton, there were no points available for a sprint finish. This meant that the pace never really ramped up in earnest. Once I heard the bells ring for the final lap I managed to work my way up towards the front of the main peloton down the back straight and finished the lap towards the front of the main group. Little did I know that Si was actually stuck to my back wheel during the final half a lap and once over the line he thanked me for a good pull up the outside of the peloton – unfortunately he got boxed in and couldn’t come round me for a sprint. With only the top 10 places getting points at the race I knew that grabbing some points in my first race was probably out of the question. The race was a huge learning experience; one that has left me wanting to get back out there and see what I can really do in a bike race. There is definitely still plenty more to learn but it’s a steep learning curve and I’m looking forward to seeing where it leads. Congratulations must go to Bertie Newey of Catford-Banks who outsprinted a group of Elite riders to become the first third-category rider to ever win the prestigious Eddie Soens race. Finally I would like to thank Carl Lawrenson and Merseyside Cycling Development for organising and promoting the event and of course Ellen Isherwood for the great photos (as usual). I don’t have anything to compare the event to but everything ran smoothly and it was an enjoyable experience. This entry was posted in Results and Reports and tagged Eddie Soens Road Race, Nick Pilling, Si Deplich. Bookmark the permalink.